It’s been a long hot summer in most of the U.S. this year, but this weekend is finally bringing some relief. Question is: will the market start to cool off too? From the chart below of the NASDAQ Composite Index we can see that we’ve actually had quite a run lately. The chart shows it all. 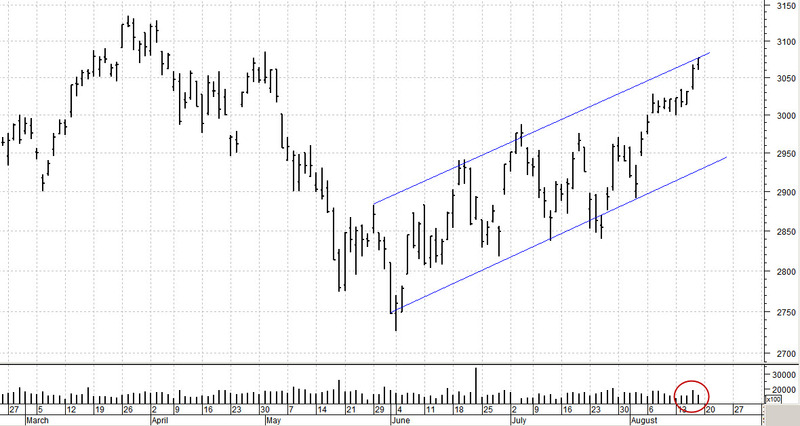 In a definite up trend, at the upper edges of the channel. Volume has been modest at best, there is no signs of panic buying or selling either. Europe is on vacation until September, so the news is rather quite from there. Maybe a slight correction after options expiration on Friday, or maybe a slow tapering off trading range. We’ll just have to wait and see since no one appears to be tipping their hand right now. As you would expect, the price strength has increased and is fairly strong right now. The green “slices” out number the yellow and red; prices are moving up in a broad fashion. A sign of a healthy market but we must see the strength of a correction to fully appreciate its true inner strength. Which sectors are favored right now? The tables below show the strongest and weakest 10 sectors. In the short term, where to “be” and “not be” in this market. So that’s about it for now. Last week was a strong & positive move up, but we can’t except that to continue without a challenge. If not now then in early September, which is not that far off. Have a good week. ………. Tom ………. chart courtesy of MetaStock; tables & pie chart by www.HighGrowthStock.com used with permission.